Teach Cello with the popular Suzuki Cello School. 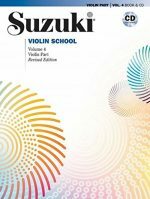 The Suzuki Method(R) of Talent Education is based on Shinichi Suzuki's view that every child is born with ability, and that people are the product of their environment. According to Shinichi Suzuki, a world-renowned violinist and teacher, the greatest joy an adult can know comes from developing a child's potential so he/she can express all that is harmonious and best in human beings. Students are taught using the "mother-tongue" approach. Each series of books for a particular instrument in the Suzuki Method is considered a Suzuki music school, such as the Suzuki Cello School. Suzuki lessons are generally given in a private studio setting with additional group lessons. The student listens to the recordings and works with their Suzuki cello teacher to develop their potential as a musician and as a person. 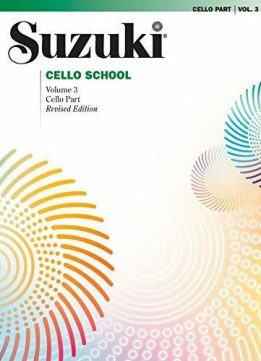 This Suzuki Book is integral for Suzuki cello lessons. Titles: Berceuse, Wiegenlied or Lullaby, Op. 98, No. 2 (F. Schubert) * Tonalization: The Moon over the Ruined Castle (Taki) * Gavotte (Lully) * Minuet from Sei Quintetti for Archi No. 11, Op. 11, No. 5 in E Major (Boccherini) * Tonalization: The Moon over the Ruined Castle (Taki) * Scherzo (Webster) * Minuet in G, Wo0 10, No. 7 for Piano (Beethoven) * Gavotte in C Minor, Gavotte en Rondeau from Suite in G Minor for Klavier, BWV 822 (Bach) * Minuet No. 3, BWV Anh. II 114/Anh. III 183/Anh. II, 115 (Bach) * Humoresque, Op. 101, No. 7 for Piano (Dvorák) * La Cinquantaine (Gabriel-Marie) * Allegro Moderato from Sonata I in G, BWV 1027 for Viola da Gamba (Bach).